So often I hear from people, that they are burned out and have lost their edge. They feel they keep working and working and and have forgotten what lead them there to begin with and why they are doing it. That they have lost the spark that motivates them to be curious and they have struggling to keep feeding the energy to be creative. Their hunger for change is huge, but their lust to create change has lost its fire. They know they are hungry from something, they just don’t really know what, so they stick with what they know. Koki is working tirelessly in his restaurant every day. He and his family started out with just 5 kg. of meat to feed guest and are now using 160kg per week. He is spending hours cooking the meat over an open fire, which is the traditional way to cook in Costa Rica. He has found that it takes a very specific type of wood to make a fire that makes the meat tender and taste, well, out of this world. He told me what kind of wood it is, but I will keep it his secret ingredient. Even though Koki said it was not the thing that made his food so special, his passion for cooking was. His restaurant is a destination to say the least. 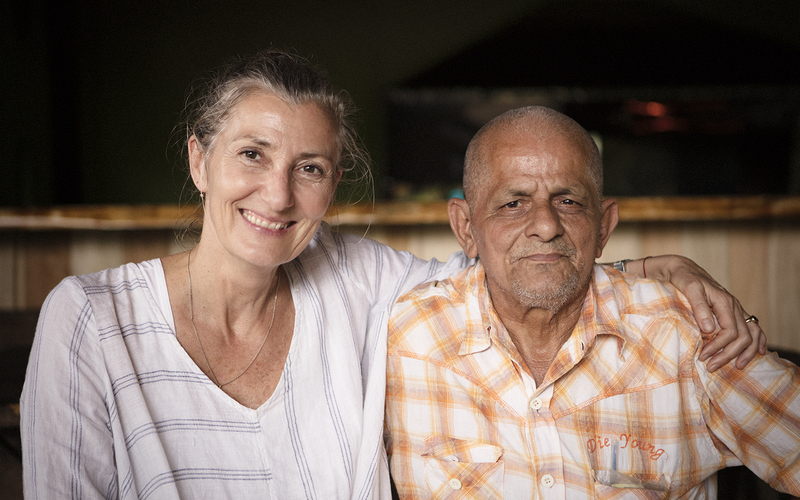 Unless you are a neighbor, and there are not many of them around, because the restaurant is all the way out the road, before you get to the rain-forest, right next to the plantation. You have to travel down a long dirt road to get to Koki’s restaurant, but it is well worth the bumpy ride. He is open for lunch and for dinner. Even the most hipster place in Brooklyn could not keep that up. But people with a passion for good home-cooked meals will travel. 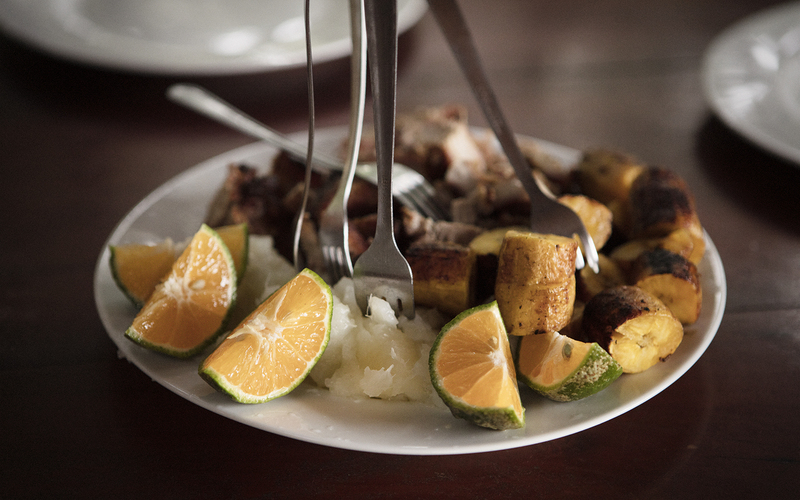 It is not just the meat that is amazing, the plate was full of yucca, plantains and fresh (orange) lemons. And then of course there was his home-made spicy dressing, which was so spicy that a drop was enough. He showed me how he was marinating, turning and slicing the meat and then putting it back on the fire. Basically slow-cooking at its best. He was nurturing the food and he knew exactly when it was just right. I asked him how, because there were no clocks or thermometers to help him. He smiled and he said; “I just know, I can feel it”. I asked him how he could feel it, he said; “in my body” and put his hand on his heart. Koki works with the local farmers to supply him. The nearby collective farming communities are all supporting each other to live a healthy and good life, which they all said was the reason why they were farming. And isn’t that really what drives our choices? That we can know why we are doing what we are doing and share it with others. 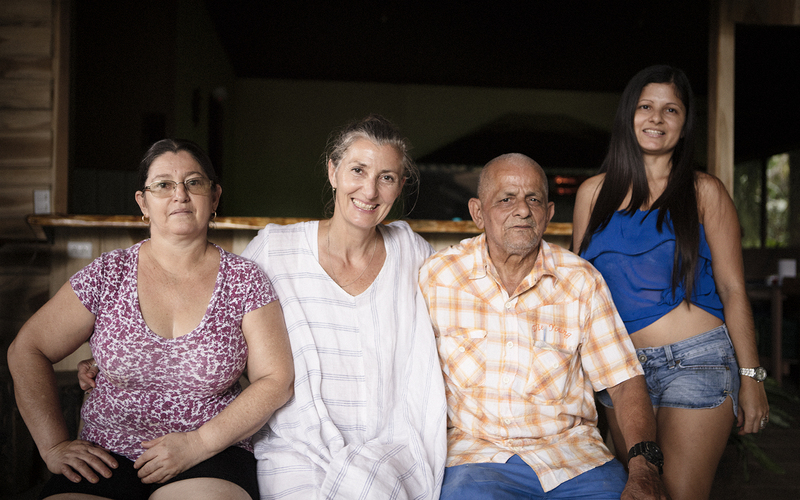 Our storyteller project was sponsored and supported by Arenas Del Mar, Cayuga Collection and Coffee Abroad.